The most books I had ever read in a year, prior to 2016, was about 35 – back when I was in high school and had no social life to speak of. I set a goal this year of 52, thinking that perfectly within reach considering my output last year (29). Well, here I am writing my 104th review. 104, you guys. I’ve written over 52,000 words describing my reading exploits this year – and that is neither an exaggeration nor an estimate. This is insane. The downside to this, however, is that I don’t remember so many of the books I’ve read. The upside to this is that I just re-read some of my reviews and realized I sometimes have more fun writing the review than I did reading the book. This book, much as I liked it, kind of falls into the former camp. It’s already become hazy, and I only finished it a couple days ago. Much of what I wanted to say has already slipped through my fingers. A year from now, I probably won’t even remember this book. That’s kind of sad, because it shouldn’t be seen as a reflection of the book so much as it is a consequence of me jumping from one book to another without giving each the time needed to breath and have an impact. On balance, I think I’m benefiting more from all this reading than I am suffering, but it’s not without its drawbacks. I shouldn’t like this book. But i do. It shouldn’t speak to me. But it does. Sally Thorne hits all the same points as Colleen Hoover and Lucy Parker, but they are so much more effective, here. As a falling action, love is so much more captivating than it is as a normalized state of being. The act of falling is both thrilling and invigorating. You’re filled with the promise of discovery and the certainty that your life is on the up-swing. Being being in love, the daily grind of it, can be both infinitely more rewarding and a pale imitation of that early stage of hedonism. I think this dichotomy is why I struggle with the romance genre. I enjoy falling in love – I mean, who doesn’t? But love as a state of being is deeper and more relevant to me than the fresh promise of newly discovered passion. So Act Like It, while entertaining in its way, was ultimately unsatisfying and a bit tepid. 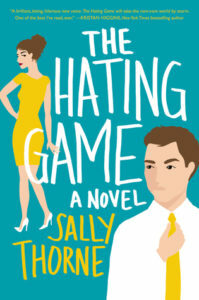 The Hating Game is certainly heavily reliant upon the two principle characters falling in love (ugh, spoiler? ), but you spend a lot more time with them after they make the connection. There were numerous points in this book where Thorne almost lost me. Moments when I started looking at the next book in my queue and wondering how long I wanted to stay in this world, and then she’d throw in a little character flourish or exchange between Lucy and Josh that would pull me back in. There is more, here, than a steamy affair between two attractive people. Lucy felt like a real person, even when Josh sometimes felt like an archetype. While I did find her to be fairly dumb (I mean, really? She was that clueless about how he felt about her? ), but she was likable, and I actually bought that they went from hating one another to loving each other. Not that I’ve ever known a relationship to morph so extremely, the path it took wasn’t a complete farce. But where this book really shines in the first, I don’t know, quarter of the book. Lucy has built this game in her mind between her and Josh. They stare at one another, they make rude and insulting comments, they’re playing a constant game of one-upmanship (turns out, that’s how you spell that – I Googled it, having no idea how to actually write that phrase out. Weirdest diversion of the night, right there). I could literally read an entire book of Lucy and Josh hating each other. It was that delightful. There were moments of me actually laughing out loud, and quite a few more of me smiling quietly to myself. These moments were enough for me to be interested in other books by Thorne. I know a lot of you have read this book already, and for those who haven’t, I strongly suggest that you pick it up. It really is as worth your time as everyone says. Take that from someone who doesn’t even like these kinds of books. I should probably give it 3.5 stars (because it just doesn’t “feel” like a 4 star book, even though I enjoyed it), but it’s my double Cannonball, so I’m feeling generous. Share the post "Turns out, we all do need a little romance in our lives"
Congrats Congrats! I know it’s not your genre, but what a great book to double Cannonball with! I’m so glad you enjoyed it. Thanks! I saved this specifically for my double. Yay!!!! Happy double, and I’m glad you liked this. I douibled last year, and much of what you say up top I can agree with. There are so many books that I am only faintly aware of even now, but there are also some magnificent books which I have discovered and read since ramping up my voraciousness that I simply wouldn’t have found without the Cannonball. I intentionally slowed down a bit this year, and am on pace to read 85 this year, but that will still be my second most read year ever. And congrats for reading outside of your comfort zone, its such a tough thing to do. Yeah, I think I’ll read some longer books next year. I’ve been pretty slack when it comes to history, and those typically take a bit more time to go through. Happy double Cannonball! You’ve read and reviewed 104 books AND you’re doing an amazing job with all our stats. That’s such good work. I’m also incredibly happy that you liked the book and that maybe, possibly, it will make you consider reading more romance at some later date. I agree completely that this is a better book than Act Like It. Keeping up with the database is part of why I’ve read so much, I think. I’m not only seeing everything we have read, but all the stuff we havent6, which makes me want to go back and read some of my favorites just so they’ll make it into the database. I’ve still got a Courtney Milan book in the pipeline that I’ll probably read next year. My tastes are so narrowly defined, though. There just needs to be more Rainbow Rowell. Congrats on both your double Cannonball and thoughtful review.